As one of the largest public universities in Indiana, Purdue University strives to demonstrate unyielding and uncompromised integrity in support of the highest standards of excellence. The Project Management Office (PMO) at Purdue University takes this into consideration with every decision it makes as it leads projects and supports the ways projects are managed in IT to support the initiatives of the university. This blog provides a summary of the recent case study and shares the challenges the Purdue University PMO was facing, their approach to improvement, and some of the benefits realized after improving visibility of project data to inform the business. Founded in 1869, Purdue University is a top public research institution located in West Lafayette, Indiana, with nearly 17,000 faculty and staff supporting approximately 41,000 graduate, undergraduate, and professional students. The university’s project management office (PMO) was created in 2015 to bring structure and organization to IT project management. The PMO at Purdue University regularly supports between 400 and 500 projects at any given time. The tools used to manage these projects varied widely with no integration, therefore no real visibility into project statuses, costs, dates, or resource capacity. Without reliable reporting, business leaders had little to work with when it came to making and validating key business decisions. A priority was set to find a solution that would improve data quality, ensure consistency, and enforce adherence to specific governance policies. The end-goal was to get reliable, timely data into the hands of decision-makers, leaders, and project stakeholders via regular, consistent status reporting. 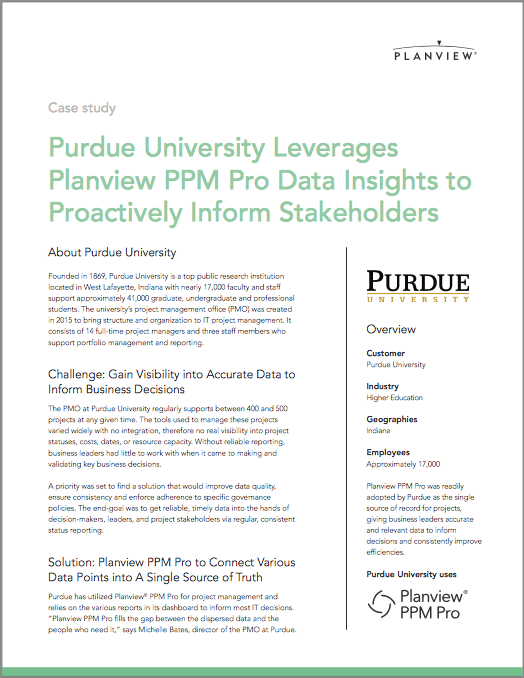 Planview PPM Pro® serves as Purdue’s single source of record, providing project data that stakeholders need to monitor projects and glean insights, helping them understand and better prioritize the work that will drive the university’s goals and initiatives. Depending on the user, reports can be customized to display exactly what each user cares most about, eliminating the practice of generating irrelevant reports no one uses. “Planview PPM Pro fills the gap between the dispersed data and the people who need it,” says Michelle Bates, director of the PMO at Purdue. “The solution enables us to generate high-level to granular-level reports specific to the user to the people who need to data have it without having to dig for it. The reports and dashboards provide Purdue with decision-driving data and information that increase data quality and provides drill-down details such as the project status reports that roll-up critical project information such as milestones, hours and costs, and all issues and risks associated with each project. With Planview PPM Pro, the PMO can also track time to support compliance, resource management, and gain a comprehensive view of costs around maintenance, unplanned, and strategic projects. “If we, as a PMO, want to be effective and efficient, we must track our time based on our IT spend,” says Bates. The solution has been a valuable asset for the PMO at Purdue University, supporting their efforts to continually improve their decision-making process for many years. They now review historical data in the system to predict what may happen this year and the years to come. Data within Planview PPM Pro is also calculated to determine when they believe a project will complete based on its current pace. These types of predictive analytics give Bates and her team a different way to present data, so leadership has information that spurs conversations. Planview PPM Pro was readily adopted by Purdue as the single source of record for projects, giving business leaders accurate and relevant data to inform decisions and consistently improve efficiencies. Here’s a link to the full case study PDF. Cetiera is the customer marketing specialist with a focus in the portfolio and resource management, product innovation, and capability and technology management solutions. She is currently responsible for supporting sales enablement, demand generation efforts, and customer advocacy and engagement. In addition to managing the Planview Customer Community, Cetiera is on the Planview Horizons Customer Conference committee. She is passionate about engaging and building relationships with customers. She graduated from the University of Texas at San Antonio.